September saw a 45 per cent drop in Palestinian exits through the Israeli-controlled Erez crossing of the occupied Gaza Strip, Israeli NGO Gisha reported yesterday. According to the press release, there was a total of 5,263 exits of Palestinians through Erez in September, a decrease of 45 per cent compared to August (9,626), 54 per cent compared to July (11,522), and 12 per cent compared to the monthly average in 2017. “It is also the lowest number of exits in any month so far in 2018,” Gisha added. During September, the NGO added, the Erez crossing operated for just 15 days, due to a combination of closures for Jewish holidays, and as punitive measures in response to protests. The most significant drop was in the number of traders, or merchant, exits during September – just 2,489 from 5,516 in August. In 2016, by contrast, the monthly average was 6,637. Overall, the number of merchants holding valid exit permits stood at 1,419 at the beginning of October, compared with 1,495 at the beginning of September, 2,136 at the beginning of August, 1,900 in July and 2,046 in June. Gisha also condemned the Israeli government’s recent decision to block the entry of fuel and gas supplies into the Gaza Strip as collective punishment, and urged Defence Minister Avigdor Lieberman to reverse his decision. Hamas yesterday called on Israel to end its 11-year siege on the Gaza Strip instead of launching “empty threats” and “creating more crises”. “Hamas lauds the legendary Palestinians participating in the protests of the Great March of Return, aiming to restore their rights and achieve their legitimate demands, above all of which is living a decent life in dignity and ending the Israeli siege on Gaza,” a statement published on Hamas’ website said. Australia will consider recognising Jerusalem as Israel’s capital and shifting its embassy there from Tel Aviv, Australia’s Prime Minister said on Tuesday, Reuters reports. Last December, US President Donald Trump reversed decades of US policy by recognising Jerusalem, enraging the Palestinians and upsetting the Arab world and Western allies. Australia was firm in its refusal to follow suit at the time, however, Prime Minister Scott Morrison told reporters in parliament he was now “open-minded” about doing so, while not changing Australia’s policy of support for a Palestinian state. “The orthodoxy that’s driven this debate which says issues like considering the question of the capital is taboo. I think we have to challenge that,” Morrison said. “The whole point of a two-state solution is two nations recognised living side by side,” he added, saying he was open to the suggestion from Dave Sharma, Australia’s former ambassador to Israel, that Australia support West Jerusalem as Israel’s capital and East Jerusalem as Palestine’s. The US Embassy became the only foreign embassy in Jerusalem in May, and Guatemala and Paraguay followed Washington’s lead days later and also moved their embassies, although Paraguay returned its mission to Tel Aviv last month. Israel closed its embassy in Asuncion in response. Sharma, who was ambassador to Israel between 2013 and 2017, is on Saturday standing as a candidate for Morrison’s ruling Liberal Party in a crucial by-election in Sydney. Morrison also said Australia would review its support for the Iran nuclear deal, under which sanctions were lifted in return for restraints on its nuclear program “to determine whether our current policy settings remain fit for purpose”. Trump decided in May to abandon the pact and to restore economic sanctions on Iran, including those that seek to force the OPEC member’s major oil customers to stop buying Iranian crude. 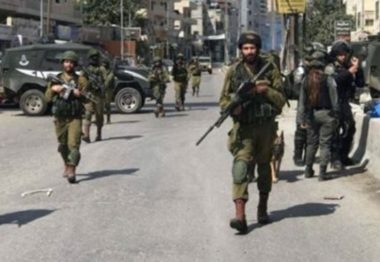 On Monday October 15th Israel’s occupation forces shot and killed 22-year-old construction worker and part time university student Elias Saleh Moussa Yassin at a junction in the town of Haris in the Salfit district of occupied West Bank. The so-called Gitai junction between the illegal colonies of Ariel and Burqan was manned by two Israeli occupation soldiers. According to eye-witnesses Elias Yassin was crossing the road near a bus stop when one of the soldiers shouted at him, and before he responded (or because he didn’t respond) the other soldier shot him. Israeli occupation soldiers blocked Palestinian ambulance crew from reaching Yassin and apparently didn’t give him first aid themselves. It’s claimed he had died within minutes of being shot. In the aftermath of the shooting Israeli occupation claimed that Elias Yassin was killed for ‘attempting to stab soldiers’ with a knife. No evidence has been put forth, but Yassin was from the same Salfit district town of Bidya as Aisha al-Rabi(47) who was killed on Friday by illegal Israeli settler stonethrowers and Yassin took part in carrying her body on a stretcher to the cemetery for the burial. That might or might not be a co-incidence. What wasn’t a co-incidence was that illegal Israeli settler leader Yossi Daggan arrived to the site of Elias Yassin’s killing, praising it and declaring that illegal Israeli colonies will be ‘expanded forever’. The following article, by imprisoned Palestinian national liberation movement leader Ahmad Sa’adat – the General Secretary of the Popular Front for the Liberation of Palestine – was originally published in French as the preface to the new French-language edition of “Revolutionary Suicide” by Huey Newton. It is an honor to write an introduction to this book by a great leader of the Black liberation struggle in the United States, Huey P. Newton. From inside the occupier’s Ramon prison, on behalf of myself, my comrades and the Palestinian prisoners’ movement, we extend our clenched fists of solidarity and salute and arms of embrace to our Black comrades whose struggle for liberation in the belly of the beast continues today against fierce repression. From Ansar to Attica to Lannemezan, the prison is not only a physical space of confinement but a site of struggle of the oppressed confronting the oppressor. Whether the name is Mumia Abu-Jamal, Walid Daqqa or Georges Ibrahim Abdallah, political prisoners behind bars can and must be a priority for our movements. These names illustrate the continuity of struggle against our collective enemy – their legacies of organizing that reach back to the anti-colonial, liberation movements of the 1960s, 1970s, 1980s to today. Political prisoners are not simply individuals; they are leaders of struggle and organizing within prison walls that help to break down and dismantle the bars, walls, and chains that act to divide us from our peoples and communities in struggle. They face repeated isolation, solitary confinement, cruel tortures of the occupier and jailer that seek to break the will of the prisoner and their deep connection to their people. So when we witness the escalation against our movement as we see today in the Philippines, as we see the murderous and orchestrated attacks on our Palestinian resistance, as we see the criminalization of Black people and movements, it is clear that we are still facing the situation that Huey Newton identified and confronted. We are still seeking to defend our peoples from the relentless assaults of capitalism, Zionism and imperialism and their police and military forces. We have not yet been able to realize our dreams and transform the prisons into museums of liberation. Revolutionaries across the world struggle and dream for this future, in every movement of oppressed people. Indeed, when we speak of the prisoners’ movement, we are in essence speaking of Resistance. Prisons exist for a reason, for the needs and interests of those with power. And when there are prisons to lock up the people, when there is occupation, colonialism, oppression; where there is occupation and colonization, there will be prisons and all of the laws and legal frameworks erected to legitimize exploitation, oppression and injustice and criminalize resistance and liberation. From the Fugitive Slave Acts of the 1800s to the “terrorist lists” that seek to criminalize and isolate the resistance movements of the peoples of the world, these are reflections of a war on the people. We salute sister Assata Shakur, still struggling and free in Cuba, while facing renewed threats and “terrorist” labeling to justify hunting down this global symbol of freedom. This also illustrates clearly that the struggle, the cause, and the movement of the Black Panther Party and the Black Liberation Movement are not a closed file. It is an open file, an ongoing struggle and a continuing movement for justice and liberation. As I write today, the revolutionary Palestinian Left, the Popular Front for the Liberation of Palestine, is marking its 50th year of struggle, a time for both celebration and review of this legacy in order to sharpen and strengthen our march toward revolutionary victory. Similarly, we have just passed the 50th anniversary of the founding of the Black Panther Party, whose vision for revolutionary change continues to be just as relevant today. This is a legacy that is carried on both with ideas and with people themselves whose histories of struggle continue to animate and inspire their communities. You could pass by the first prisoner of the PFLP somewhere on the streets of Berlin, still organizing Palestinians. You could feel the legacy of the Black Panther Party and the continuing Black struggle on the streets of Chicago, Oakland and Harlem. There are people who carry within them the legacies of struggle as a human treasure. The experiences of the elders of our movement, especially those who have come through prison, stand alongside the ideas passed down through writing, books and literature in carrying on, from one generation to another, the trajectory and path of struggle toward a future in which youth are coming forward to lead Black and Palestinian revolutionary struggles for liberation. Every political prisoner, whether they are currently in prison or not in prison, carries within them the dream and reality of liberation and what it can and must mean in practice. Today, when we look at the Black Liberation movement or the Indigenous and Native struggle in the United States and Canada, we are talking about the same camp of enemy that we confront in occupied Palestine. The bullets that assassinated Malcolm X or Fred Hampton could have been used to kill Ghassan Kanafani or Khaled Nazzal or Mahmoud Hamshari, and today we see the same tear gas and bullets shipped around the world for use against the people. We see corporations like G4S profiting from the attacks on our movements and the mass imprisonments of our people and U.S., European and Israeli police forces exchanging training with one another to escalate racism, “counter-insurgency” and repression on the streets of our cities, camps and villages. In our circles here in prisons, we always hope and wish to communicate to movements elsewhere and political prisoners everywhere. We want to share our experiences with one another to strengthen all of our movements for liberation and the movement to free our prisoners. The political prisoners have a firsthand experience of confrontation, and the experience of the prison can be a transformative one for a political prisoner. It is not an individual experience but a collective one; the heroism of a prisoner is not simply to be in prison but to understand that they carry with them the leadership of a movement and a continuing struggle in a new location that continues to have international reverberations. Georges Ibrahim Abdallah today is struggling in Lannemezan prison just as Mumia Abu-Jamal is struggling in Mahanoy. The heroism also does not come simply in that one has spent years in prison and now has been released; but in being a veteran of struggle who continues to carry the message of liberation for those who remain. The political prisoner is not weak and is not broken, despite all of their best efforts. The responsibility of the political prisoner is to safeguard the flame. This is not a role that we have sought out or worked for. But now that we are in this position we must hold our position to set an example, not to our people, who are rooted and steadfast, but to the enemy, to show that imprisonment will not work to defeat us or our people. We carry a cause, not simply an individual search for freedom. Israel or France or the U.S. would free us, or Georges Abdallah, or Mumia Abu-Jamal, if we were willing to become tools of the system or betray our people. But instead, the prisons have generated striking examples of a culture of resistance, from art, to literature to political ideas. Today, our movements and the revolutionary movements around the world are facing very difficult times. However, these difficult times can also hold value if we look more closely; we are paving the way for new generations of revolutionaries around the world who can still carry the demand for socialism, for people’s democracy, for an alternative world. In the era in which Newton wrote, movements and prisoners shared experiences and communicated through letters, books and art, often smuggled out of or into prisons, past censors and iron walls. Today, with all of the great revolutions in technology, political prisoners are struggling to have their words heard at all, denied access to even telephones to speak with our families and loved ones. Why do we still consider and read and reprint the writings of Huey Newton today? Fundamentally, because his analysis and that of the Black Panther Party was right and continues to be right, valid and essential. Today, when we see the ravages of U.S. imperialism, the threats of Trump against the world and the shooting down of Black people on U.S. streets by cops, then the fundamental correctness and necessity of the Black Panthers’ work is underlined. Today, when popular movements are under attack and liberation struggles labeled as “terrorist” and criminalized, we see a massive coercive attack on our peoples. Prisons are only one form of coercion in the hands of the occupier, colonizer, capitalist and imperialist; stripping the knowledge of the people and imposing new forms of isolation are yet more forms of coercion. The imposition of consumerism, the stripping of peoples from their humanity, the isolation of peoples are all forms of coercion alongside the prisons that act to undermine our movements, our peoples and our visions of liberation. They want to see all of our movements isolated from one another, through the terror of the “terrorist list” and the silence of solitary confinement. Capitalist and imperialist media blankets the world, so even here in Israeli prison we hear about the latest technologies in the U.S. while the repression of Black people is rendered invisible. But the reality today is that every day, a little Huey or Assata or Khalida or Ishaq is being born that can carry forward the vision of their people. Of course, I cannot speak as an expert about incarceration in the United States today. But just looking at the numbers is a stunning illustration of what is deeply wrong with the system. As Palestinians, we also face an experience of negation, of attack on our existence, as being treated as lesser or non-humans for our designated racial identity. We understand through our own experiences how occupation and capitalism are all about profit and the example that U.S. prisons are creating for the world, where prisons are seen as a source of cheap and coerced free labor and a profit for capitalism. We see how incarceration is used to control, divide and threaten communities and peoples under attack. Incarceration means a lot of money for corporations at the same time that it means a direct threat to Black children and their futures. And this is the “security solution” that Trump and U.S. imperialism is marketing to the world as a solution to the crisis of capitalism, a solution built on bloody and brutal exploitation. Here in our cells, we can feel the reverberations of these attacks and the physical impact of them in the invasions and inspections of the special repressive units of the occupier. We also see the potential and indeed, the necessity, for movements to rise inside prisons together with those on the outside. We see thousands of people sentenced to massive sentences of 20, 30, 40 years in prison and even more, stripping people’s freedom and taking people’s lives. Resistance is critical and it must have a real impact on people’s lives. Our sacrifice in prison has meaning when it can lead to fruits for the poor and liberation for our peoples. Our struggle must impact people’s lives in a material way. From Ireland to the United States to France to Palestine, political prisoners continue to be leaders in movements fighting racism, imperialism and colonialism. We also see the prisoners of the Palestinian movement facing political imprisonment around the world in the jails of the enemy – from the heroic Rasmea Odeh forced from the United States to the Five prisoners for Palestine, called the Holy Land Five, held in extreme solitary confinement alongside Black strugglers, for engaging in charity work for our people, to our dear comrade Georges Abdallah who has suffered for 34 years in French prisons. The prisons and the political prisoners are also an example of the power and necessity of “breaking the law.” The law – the law of the imperialist and the colonizer – is used to steal the rights and resources of our people and also to justify our imprisonment and repression and criminalization. Through the collective “breaking” of the law and its power to define justice and injustice – when people, collectively, confront and “break” the law, not merely as individuals but as a collective power, it loses its claim to legitimacy. Breaking of the law must become the norm, and not the exception – the law of capitalism, imperialism and exploitation. Political prisoners are jailed because they fear our actions and they fear our ideas, our power to mobilize our peoples in a revolutionary way against their exploitation and colonization. They fear our communication and they fear the powers of our people. They fear that if we come together that we will build an international front for the liberation of oppressed peoples. They know, and deeply fear, that we can truly build an alternative world. For them, this is the terror of defeat, but for us, and for our peoples, this is the hope of freedom and the promise of victory. 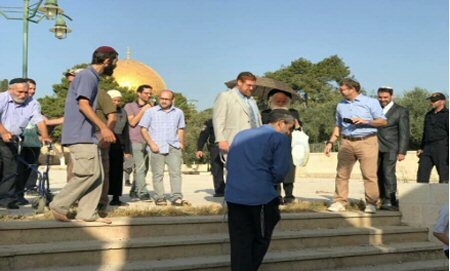 Dozens of Israeli settlers, headed by extremist American-born rabbi and member of the Knesset for Likud, Yehuda Glick, on Monday morning, broke into the courtyards of the Al-Aqsa Mosque compound via the Maghriba gate, and under heavy protection by Israeli occupation troops. Jerusalemite sources reported, according to Al Ray, that the settlers carried out provocative tours, across the mosque’s courtyards, and received explanations on the alleged “Temple Mount”, delivered by Glick, amid repeated attempts to perform Talmudic rituals in the courtyards. The sources added that Muslim worshippers, educational students, and guards of the mosque who were present, defended it with chanting and hampered the settlers from roaming it freely. The Al-Aqsa mosque Compound is confronted, now on a daily basis, by the storming of Israeli settlers, upon which they perform Talmudic rituals and desecrate its sanctity. The Israeli occupation seeks, through such measures, to divide the temporal and spatial division of the mosque, and to thoroughly Judaize the occupied city of Jerusalem.